About 6 months ago, I spent about $800 updating my computer with new RAM, video card, a pci and pciex cards, Windows 10, and new hard drives. I've swapped out the data cables and daisy chains but it still constantly freezes and crashes. It's about 9-10 years old and I think it's had it. So I want to buy a new pc but I don't want to buy a lemon so I was wondering if people here can help me choose one that has a good reputation for durability. Right now, my computer has 12 internal hard drives and 7 externals. Each is either 1Tb or 2Tb. I store video files on them. What I'm looking for is a computer that has the capacity to hold between 12Tb-16Tb (3 or 4 hdds) inside the computer cabinet. I don't do gaming. I copy my videos onto external hard drives and connect them to a Micca and watch them on my tv. The only other thing I do with my pc is go on-line to check my email and Google things, etc. I understand that today's computers can be connected to a tv, so that would be a great feature for me too. But, basically, I just want enough internal hdd space to store my video files. Since I just spent $800 updating my existing computer, money is scarce, so cheaper is better but I don't want refurbished, just a new one. I bought my own Windows 10 Home disk during my updating so Windows doesn't have to be installed, I can do that myself, if that would make a pc cheaper. My hdds are now in JBOD configuration and I don't want to set up a RAID array with the new one. Can someone give me some recommendations? Edited by Denisejm, 18 March 2019 - 11:05 AM. You sound as though you would be OK building your own using some of your existing parts. You would get exactly what is required and work out cheaper. If you would like some suggestions, lets see exactly what your system is. What is the make/model of your case and PSU?? Then please follow the below. Instructions thanks to Phillpowr2. Right now, I have 2 twin sets of RAM. One set (two sticks) is removed. My computer also has 12 internal hdds but I have only my OS hdd connected. This is because my computer has started to constantly freeze/crash if I connect more than this, so Speccy isn't going to give you the entire picture. 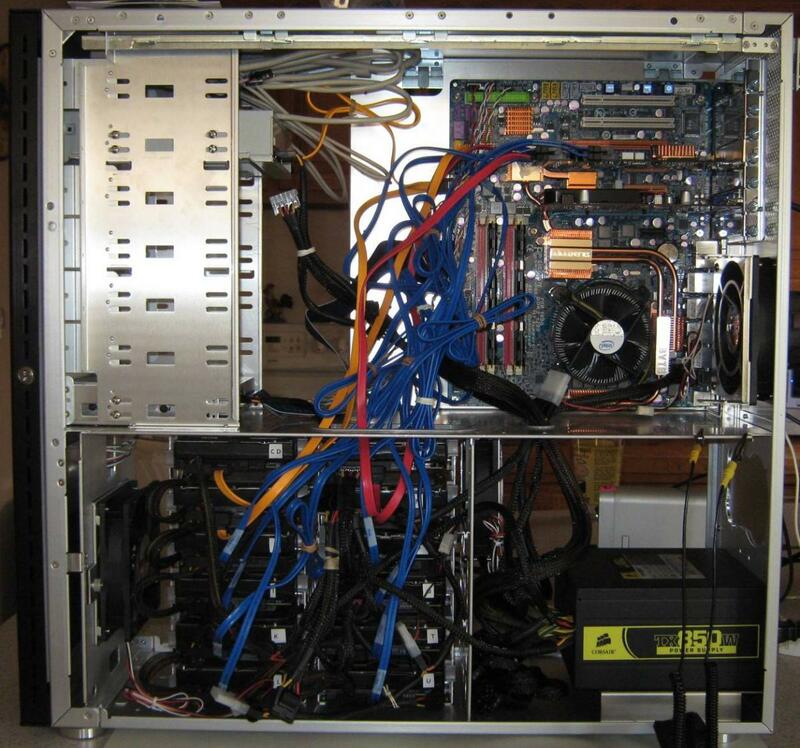 I had nightmare issues building my present pc 9 years ago and nightmare issues building the one before it so I'm not sure if I want to rebuild my computer. I was hoping that a pre-built would contain all the features that I need to store video files. I'm willing to buy additional hard drives but I need a computer that has the bays for them, a motherboard that has the ports for them, a PSU that can handle several 6-8Tb hdds, a CPU that won't get "confused", and enough RAM (I can buy extra) to run it all. I didn't think that, in 2019, it would be difficult to find a computer such as this. Maybe there just isn't a call for such a computer so manufacturers don't make them. Edited by Denisejm, 21 March 2019 - 04:41 PM. I thought that with 12 internal drives installed, you had a special MB, but I se yours only has 4 SATA ports, so how are they connected?? and what case do you have that can take those 12 drives?? I will see if it is possible to configure a PC with what you want on one of the sites. My motherboard has 12 ports but 6 of them are for RAID use only, so 6 hdds are connected to the motherboard and the other 6 are connected to adapter cards. I have a LIAN-LI PC-201A case. 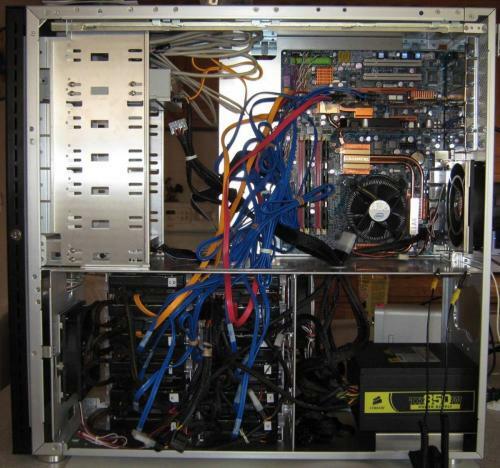 I've attached a picture right after the build was complete in 2009. As you can see, my data cables look terrible but you'll see what it looks like. Thanks, I'd appreciate that. I want to go down to 4 large hdds connected to ports on the motherboard only, no adapter cards. Edited by Denisejm, 20 March 2019 - 06:16 PM. I use eCollege to configure pre built systems as they have a diverse selection of parts, a good reputation and a 3 year warranty on parts and labour. All the MBs will take 6 drives, OS, + 5 Data. If you pick the AMD RYZEN 5 2600 6-Core , you will need to install your discrete GPU. The integrated graphics in the other 3 builds are more than good enough for your usage. I look forward to your questions, as sure you will have some. I have a few questions to begin with . . .
1. The prices you quoted are for completely built computers, not just the parts? 2. Could I install my existing SATA hdds in some of the bays. They're not solid state. 3. If something broke on the computer, how would I get if fixed under the warranty? 5. I'm not into gaming, I store and play video files (.avi, .mkv). I noticed some of the computers you list mention gaming. Would that make a difference? 1. yes, includes shipping and 3 years warranty. 2. yes, you can install 5 SATA HDDs. 3. You would need to contact the site, inform them of the issue and request a RMA, (Return Merchant Authority), they would issue you with a code number. You would have to look through the terms and condition to see if you would be responsible for shipping. 4. NO. you said you had a retail one. 5, makes no difference, it's just marketing splurge, They will all do what you want. They differ a little in features and upgrade potential. You would have to look through the terms and condition to see if you would be responsible for shipping. Where can I look at the terms and conditions now? I have a few more questions . . .
1. Since I used my Windows 10 disk to install Windows on my existing computer, would MS give me a problem when I try to install it on another computer? 2. Approximately how much would it cost to ship the computer? Is it a USA address? 3. How many external USB ports will be available? 4. How many external SATA ports will be available? 5. My computer and its parts are 9 years old. Will my old-type connecting cables to the internet, speakers and monitor be compatible with a new computer? 2. It is a USA address. You will need to contact eCologe support and ask them aprox how much shipping would be from your address. 3. Depends on which MB is used. Go through and compare the specs. 4. No external SATA ports. You would need o use a PCI card as you are doing with your existing PC. 5. You will need to tell us exactly, (type, make, model) of internally installed devices you want to use. My first choice for your needs is the Intel i3 build. I've been working on my computer since Friday. This morning, I installed a new driver for my adapter card and I think it might have fixed a problem. I have only 1 hdd connected to it so far and I'll be adding another one this evening, another one tomorrow morning, etc, to see how it goes. If I can keep this pc up and running for another couple more years, financially it would be good for me. I haven't ruled out buying a new computer though, and I like the Intel i3 build as well. I'll keep you updated. Lets have another look at your computer system, run a new Speccy, as the first link you posted has disappeared. I had noticed you had a problem with Windows Update. Please take an upload a screen shot of Disk Management. Click Start, > click run, > copy and paste this command into the empty box, diskmgmt.msc > press enter. When disk management opens, > go full screen, > take a screenshot and attach it with your next reply. .
​Are you going to use windows storage space to configure your drives? 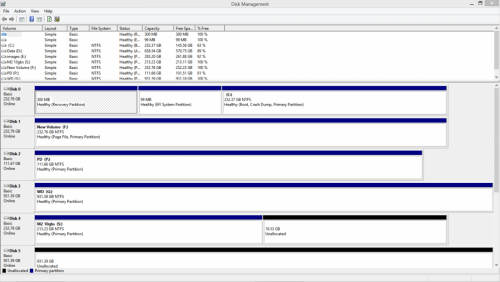 Attached is a screenshot of Disk Management. I also attached a screenshot of Device Manager. Highlighted is the driver that I installed for the adapter card. Edited by Denisejm, 26 March 2019 - 05:32 PM. I had to take 2 screenshots to get the entire list of hard drives.